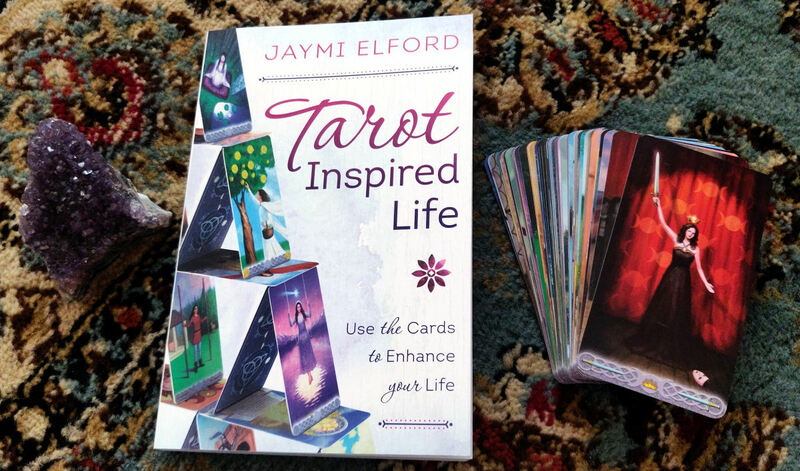 Tarot Inspired Life by Jaymi Elford is an incredibly powerful handbook for anyone who is observing a Depth Year in 2019, especially with the tarot. If you don’t know what a tarot Depth Year is, go on YouTube, type in to the search bar “depth year” and a bunch of Tarot YouTubers with videos on the tarot Depth Year will pop up. In a nutshell, it’s about committing the year to deepening your current tarot practices, rather than trying to expand them. Elford’s book is all about how to work with the tarot in deeper, more meaningful ways that enhance your spiritual practice, how to infuse spirituality and intuition into every mundane aspect of your life, and how to seek purpose in the every day. So it’s the perfect personal guide to help you navigate your tarot Depth Year. There’s an Exercise List in the front pages that can serve as your personal checklist for working through the book. 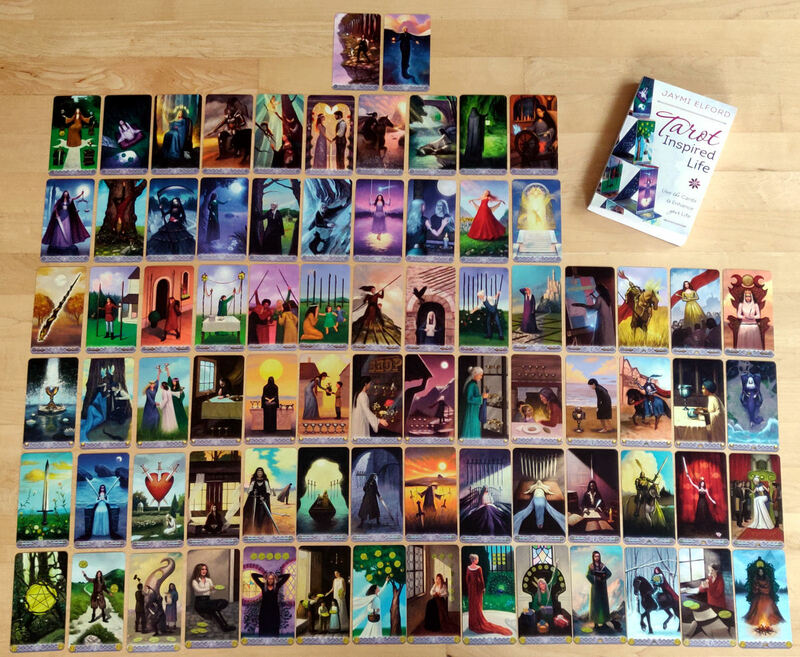 I decided on The Grand Matrix (p. 33) to start off with, which is an exercise for laying out all 78 cards on the floor to construct a tarot matrix with the cards in order–observing any sense of meaningful order that’d work for you. “The Grand Matrix helps you investigate and unlock all the secrets of a single tarot deck,” Elford writes. And I absolutely agree. The book recommends the Majors, 0 and 21 up top, then Keys 1 through 10 in one row, 11 through 20 in another, and then the four suits from Ace up to the King (p.34). After creating your Grand Matrix, study the rows and columns to spot patterns, then ruminate on those patterns. What do those patterns signify to you? I worked with Elford’s Triple Goddess Tarot, illustrated by Franco Rivolli. I posted a review of the deck here back in 2017. This is also the deck you see pictured on the cover art of Tarot Inspired Life. By the way, oops, in my morning stupor I mixed up the Page and the Queen in the Suit of Pentacles. So above, where you see the positioning in the spread for the Page of Pentacles, I’ve put the Queen and the position for the Queen, I put the Page. Ma bad. I’d get a blank journal to use with Tarot Inspired Life. Log all of your exercises, reading results, personal reflections, and notes on the work you do with the book. I love how Elford has organized this book. In the beginning of each chapter she gives you bullet points of your core objectives for that specific chapter. For example, in Chapter 1, you’ll learn the myths and history of tarot, understand its basic structure, and discover how tarot works. Chapter 1 also gives you an overview of the archetypal associations for each and every Major, which I found really helpful. The Fool is the inner child, Magician and High Priestess are the divine masculine and divine feminine, Empress and Emperor are the temporal mother and father, the Hierophant is the teacher, the Lovers is connection, the Chariot is momentum, and so on. She goes much more in-depth for each archetype as well. She then runs you through several thought exercises to help you decode the symbolism on each card, for any tarot deck. 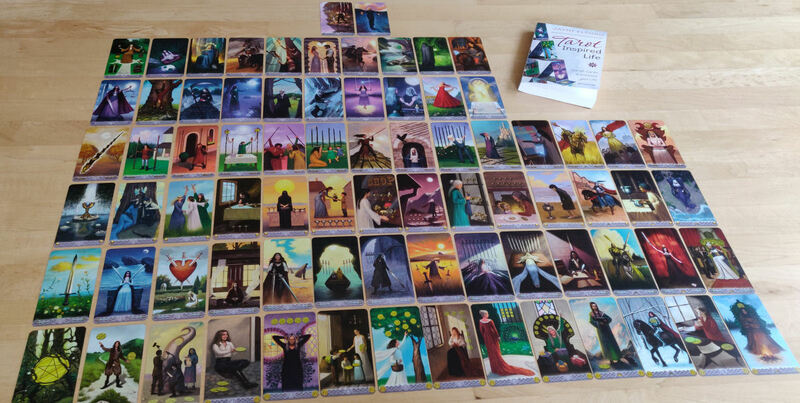 If you’re looking to unpack a particular tarot deck that’s been giving you trouble, working through that deck with Elford’s Chapter 2 exercises can really help you jailbreak that deck that had been giving you trouble. Elford covers tarot spreads, how to work with spreads, creating your own spreads, and daily tarot practices. A lot of valuable tips and techniques for journaling are also provided, which go well beyond tarot application, but will help you to deepen your personal journal work as a whole. She encourages you to get artsy with your deck and try out different art therapy techniques to get you crafting with the tarot that not only gets your hands and brain in movement and activity, but help to deepen your understanding of the tarot archetypes. If you’re new to meditation, Chapter 6 guides you through meditation basics and how to use the tarot to initiate contact with spirit guides and divinities. The book starts to go deeper to commune with your higher self and to achieve realization of higher truths. It’s at the juncture point of Chapter 6 that you really feel the book pushes you to greater depths of personal spirituality. In Chapter 7, we get in to invocations and the power of manifestation with the tarot. Then Chapter 8 walks you through tarot rituals. We re-emerge at Chapter 9 to connect with others and here you’re given great tips on how to read tarot for others and how to connect with a global tarot community. She ends with discussions on what a tarot tribe is, how to find your tribe, and how to create your own tribe. Tarot beginners are going to want Tarot Inspired Life plus a reference manual of tarot card meanings to start exploring personal spirituality through the tarot and Elford’s diverse, practical, and meaningful exercises. If you’ve felt stuck on a plateau with your tarot practice, Tarot Inspired Life is the perfect book to help you clear the roadblocks and move ahead. Advanced practitioners are also going to want this book as a companion guide for a tarot Depth Year exploration. I found a lot of the exercises to be illuminating, and which can help me deepen my understanding of decks in my collection that I otherwise wasn’t working with due to unfamiliarity. This book has exercises tailored to helping you acclimate with any deck. Jaymi, along with a handful of others, is counted among my very first tarot friends. She welcomed me into the tarot community with open arms, unconditionally, with no skepticism or suspicion, and a lot of trust that I hadn’t even earned yet. To me that speaks volumes to her character. If you’re in any way familiar with the circuit of tarot and pagan conferences, then you already know Jaymi Elford. She’s always the one behind the scenes making sure the conference runs smoothly, new attendees feel welcomed, and yet never seeks the spotlight or wants to take any credit for her dedication, support, and ground-level running-around old-fashioned hard work. There’s so much that gets popularized and trending in the tarotsphere that can be traced back to the quiet work and contributions of Jaymi, for which she never gets credited– nor has she ever, ever complained about not getting credited. Finally, long overdue, is her debut tarot book, Tarot Inspired Life, which comes at the perfect moment in modern history to help us cultivate and listen to our inner voices and navigate these troubled times. I just bought this book yesterday and cannot wait to get started with some serious exploration of my spiritual connection to Tarot. I love the compact feel of the book…like holding a little bible…It’s layout is simple and inviting to read. The hard part will be deciding which deck i’ll choose to work with. Thanks for the great review! Stay tuned, because a future Sightsee the Tarot episode is going to be a guided tarot journaling session and reading: Rewriting Your Memories (from Jaymi’s book)! Oh, I had no idea about the depth year! I’ve been doing all this depth stuff for Pisces season, but I’m intrigued on building on it. Thanks for the tip! I'm convinced there is a circle of hell where your punishment is to wait for eternity for peach brandy jelly candies to set, which you'll never get to eat. The prospects of ending up there is enough to scare me into being good. Fortunately this is earth and in 24 hours, I'm gonna have me some homemade peach brandy jelly delights.